“The Best Main Street in America” is how Professor of Vernacular Architecture Thomas Carter described Mineral Point’s High Street. Last summer, vernacular architects from all over the country descended on Mineral Point to look at our well-preserved buildings. So you might wonder – “what is vernacular architecture?” Our Frank Beaman tells the story of what vernacular architecture means here in Mineral Point. In historic Mineral Point, the local focus was all about lead mining, as the city enjoyed its first mineral boom time in the mid-1830s. Pioneer building was characterized by one overriding rule: “Use close-at-hand native materials.” In the other Wisconsin centers, nearby forests were harvested to build log structures, but the most available building material in a mineral town was, of course, local stone. It was simply hacked and blasted from surrounding hills, cut to shape and dragged to the construction site. Even the rubble, the smaller chunks of rock, were used on walls built out of the public view. The Cornish, Welsh, Irish and German settlers counted a good number of accomplished stone masons in their number, and they used Mineral Point’s yellowed limestone to give the state a distinctive inventory of rock cottages and storefronts. These old buildings may have been equaled, but were never excelled anywhere in the nation. In 1976, in a landmark edition of Historic Wisconsin Architecture, author/critic Richard E. Perrin’s roundup of architectural gems named seventy-six structures. Of that collection, ten were from Mineral Point, including the Railroad Depot, Odd Fellows Hall, the Pendarvis and Polperro houses, Trinity Church, the Mineral Springs Brewery, stores along High and Commerce Streets, and a handful of private residences. Ten out of seventy-six – not bad for a small town! Historic architectural preservation is a way of life in Mineral Point. We work to tear away the modern “re-muddling” done on so many structures, to unveil their older strength and character. And, we work every day to keep our old buildings in good repair. 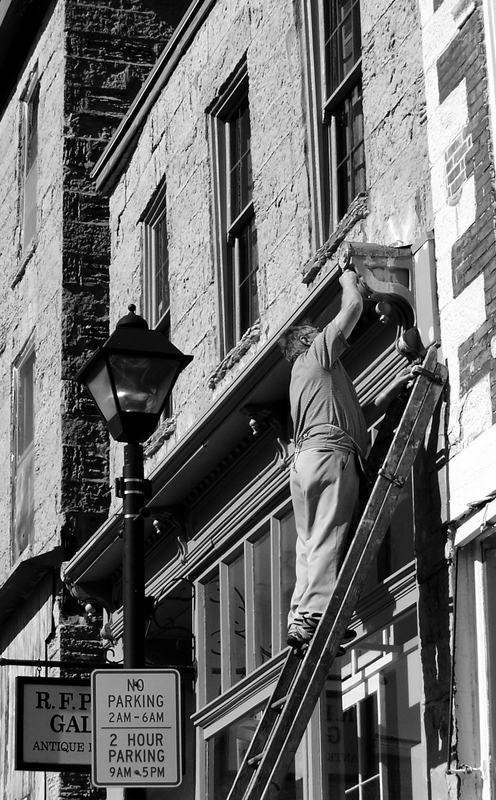 Preserving our architectural heritage is a salute to the stone masons of our colorful past. It’s also an invitation to visitors in the community, who enjoy our 19th Century environment. And, because many strong-shouldered historic buildings can be sensibly modernized to operate at lower costs than some of the modern models, it makes good business sense, too! For more information, regarding historic preservation in Mineral Point, check out this beautifully illustrated guide. Gallery | This entry was posted in Architecture and tagged best main street, Frank Beaman, historic preservation, Mineral Point, Mineral Springs Brewery, Pendarvis, Polperro, preservation, stone masons, Thomas Carter, Trinity Church, Vernacular Architecture, Wisconsin. Bookmark the permalink.